Assemblywoman Mary Hayashi (D-Hayward) issued a statement on the first United Nations International Day of the Girl. October 11 was established as International Day of the Girl by a United Nations General Assembly Resolution, recognizing the need for global advocacy and action by and for girls. Assemblywoman Mary Hayashi (D-Hayward) issued the following statement on the first United Nations International Day of the Girl. The main theme of this year’s International Day of the Girl is ending the practice of child marriage. The United Nations states that child marriage violates millions of girls' rights, disrupts their education, jeopardizes their health, and denies them their childhood, limiting their opportunities and impacting all aspects of a girl's life. The International Center for Research on Women reported that 25,000 girls are married off every day. More than half of the girls in Bangladesh, Mali, Mozambique and Niger are married before age 18. 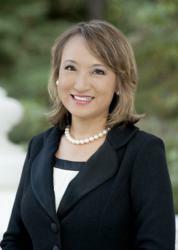 Assemblywoman Mary Hayashi serves the 18th Assembly District, which includes San Leandro, Hayward, Dublin, most of Castro Valley and Pleasanton, and a portion of Oakland, as well as the unincorporated areas of Ashland, Cherryland, San Lorenzo and Sunol.